In serving bowl, blend all ingredients except chia seeds. Add seeds and mix. Refrigerate 20 minutes. Stir again, and put back in fridge for 8 hours or overnight. 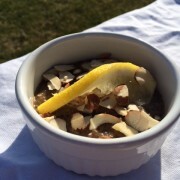 In ramekin, add pudding and top with sliced almonds and lemon wedge. Beautiful for breakfast or dessert!